Discussion in 'DIY (Do-It-Yourself)' started by bcweir, Oct 13, 2016. I have a very puzzling issue related to the trunk lock related to my 1988 BMW 750iL, production date 9/23/1987. In 2008, while the car was being kept in outdoor storage, thieves attempted to break into the trunk of my car. The break in attempt failed, however the trunk lock was damaged to the extent that it requires both the key and a set of pliers to open my trunk. The original trunk lock still installed in the car. A replacement generic lock with key I ordered in 2014. A lock supposedly keyed to my VIN number that is supposed to be a replacement for my original damaged lock. I ordered this a month ago. When I received it, I determined that my original key physically fits in this lock but will not turn in the cylinder. The parts specialist surmised that because BMW will only replace the lock and key on a car a limited number of times, it is possible that this car may have had all its locks changed at some point during its 29 year history. I purchased this car in November 2005, and until the break-in, I was able to start the car and open all doors and locks on the car with my one key. Are there any resources in which I might either be able to transplant the lock cylinder from my original damaged lock assembly to an intact one, or perhaps recode the existing lock cylinder in the one of the two new assemblies to work with my original key again? Keep in mind I am not comfortable performing this swap on my own, as there are very tiny wafers involved, and due to my eyesight limitations, I am not comfortable working with such tiny, delicate components. I am unaware of BMW limiting on how many keys they will make for a vehicle. I know the newer models only allow for 10 keys to be programmed to the vehicle before the modules and keys and locks would need to be replaced. This is a extreme case of course. I would ask if the dealer can take a picture of your key and talk to BMW's key room and see if they can match the cut of your key and the one they have on file for the vehicle. Other option would be to get all new locks and keys to keep everything the same. Thank you for your quick response. If it helps the parts representative has already requested a photo of my key which i have already sent. Any other possibilities you can think of would be most helpful. Thank you again. 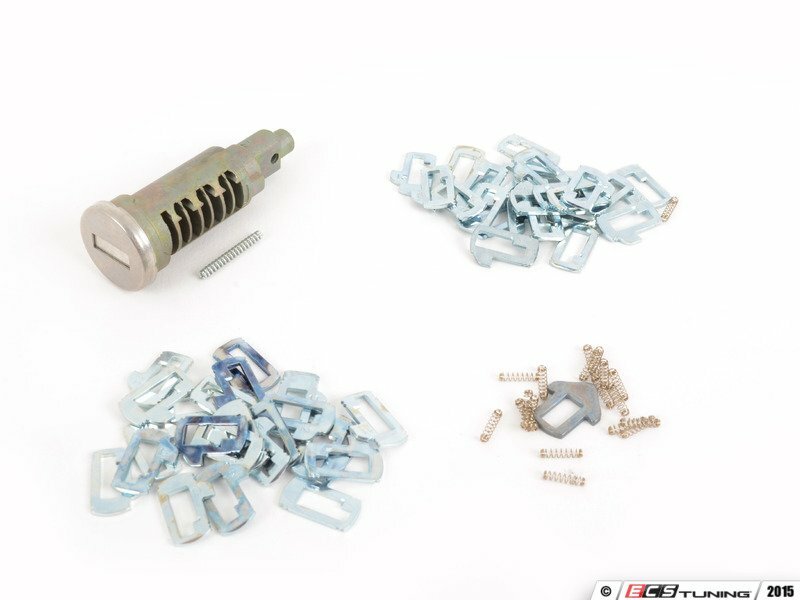 BMW sells lock repair kits (or, at least they used to), but I think they only sell them to dealers or shops, since anyone with a lock repair kit could, theoretically, key up a lock cylinder for any BMW that lock cylinder would fit. 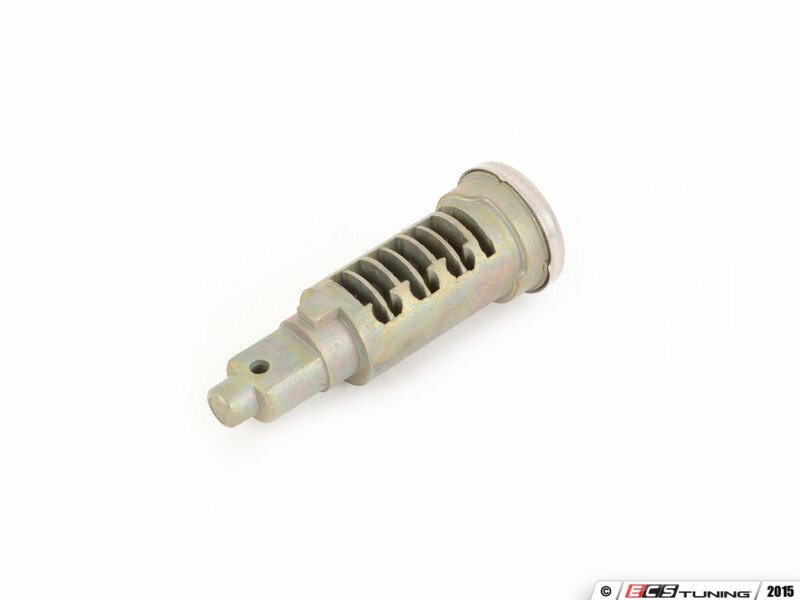 However, a couple of these pics are from ECS Tuning, so maybe ECS or others do sell them. See the realoem.com diagram also for reference, this was for an '88 750il, best to start at the beginning using your vin or yr/mo of production. The silver sorta-"O"-shaped pieces are the pins that determine the lock keying. 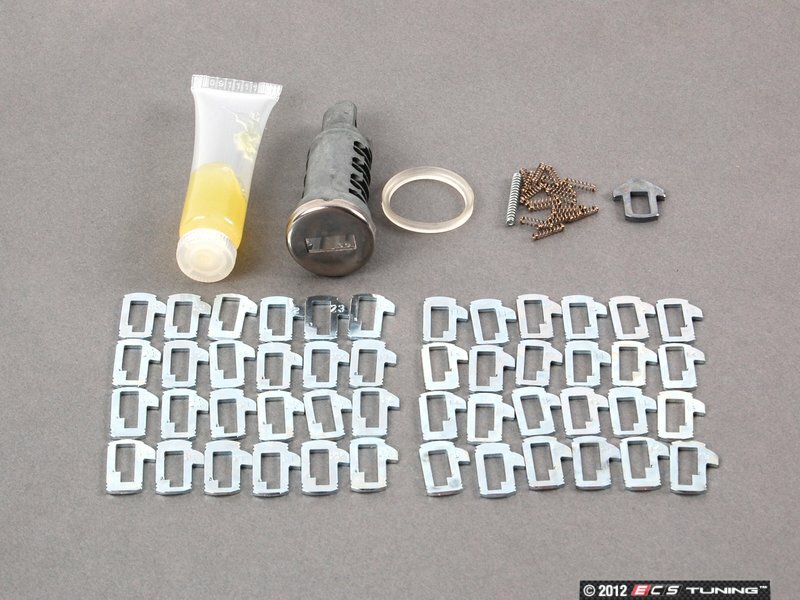 Whether those could be transferred to your new locks depends on whether they got destroyed/damaged when the lock was mangled, and whether the lock cylinder can be removed/accessed to remove the pins, while preserving their position in the lock cylinder so they can be transferred to your good one. I _think_ the hole in the end of the lock cyl. would indicate it's held into the rest of the lock mechanism by a pin, that would normally have to be driven out with a small drift (I think this vertical pin may be shown in sec. 21 of the realoem diagram, sec. 22 shows the cylinder, pins, cylinder springs, and what I think may be called the cap spring (general lock diagram here for reference). The small cylinder springs go into the round holes on the sides of the lock cyl., better seen in the 2nd & 3rd pics above. Since the pins are being pushed outwards by the springs, what happens if you free up and remove the lock cylinder without doing anything else, those just launch off into hither and yon as each one is pulled past the lock barrel as the cylinder is progressively pulled out; so, that's bad - they get lost, the springs get lost, and you lose your lock keying. As I recall, if you have the key inserted in the lock cylinder as you pull it out from the barrel, it keeps the pins retracted, and they won't go flying. However, there's nothing that holds the pins in place, so if the cylinder is pulled with either of the pin sides down, they fall out, and, the lock keying is lost. Correction: The key holds the pins in place as long as it's inserted in the cylinder (since the key goes through the open center of the pins); pull the key from the lock cyl. when the cylinder is out, and the springs will launch the now-freed pin. Point being, pulling a lock cylinder has to be done with care and patience if you don't want to lose parts, and, more importantly, the lock keying. If done carefully and slowly, the lock pins could be moved to a new lock cylinder, one at a time, taking care not to lose the keying. As you pull the key from the lock cylinder to free each pin (note that pins are on both sides of the cylinder, you don't want to be focusing on one side while having the the opposite side go flying), after putting the springs and pins in the other lock cylinder, somehow they need to be kept in place in the other cylinder - a sleeve of some kind, perhaps - the barrel the cylinder goes in might work, if there's room to access the pin sleeves with the cylinder partially inserted. Or, maybe wrap the cylinder with paper (multiple times, it would have to be strong enough to withstand the pressure from the cylinder springs) and make a paper tube; not too tight, it would need to be able to slide over the cylinder. Once all the pins are in the new cylinder, the key can be inserted and retain the pins. If I recall, the pins are numbered and or lettered with a very small stamp. If you make a note of what each one is with the side it's on and it's order in the cylinder as your remove it, you'll have your lock keying code. One downside I can see to using original or old lock pins is if they had wear on them, then that's a lot of effort to be doing transferring worn pins. However, trunk and passenger door locks typically get far less use and wear than the driver's door lock. That's a lot of words, but that's so you can see what's involved - the short answer is, yes, as far as I know, a lock repair kit could get your trunk keyed up the same as the doors and glovebox, or transferring existing lock pins would be possible, if they can be retrieved in intact condition and position in the cylinder. If the pins in your old lock are damaged and unusable, a lock repair kit might be the only option - and, with the mystery that the keyed lock you got doesn't match what you have, possibly the only relatively easy way to get the lock keying would be pull the driver or passenger door lock, pull the cylinder, and finding how it's keyed, match up a new lock using new repair kit pins. Obviously, that would mean disassembling a door lock and putting it all back, in addition to the trunk lock. Since you're uncomfortable tackling that as you mentioned, then you have to find someone who can and will. I would suggest at least using bimrs.org or bimmershops.com to find a BMW-specific independent shop in your area, or hit up any contacts off your chapter's website for a local shop reference. Also your chapter's facebook page, or forums, or any other social media they might have. Presumably, somebody local at an indy shop ought to be able to tackle that. If they've never done it, or that type of lock-work before, knowing the details I mention above ahead of time would be important to getting the keying all correct. In the meantime, since you now have two trunk locks in hand, the easiest thing would be pulling your old damaged lock and installing one of the undamaged ones, if you don't want to have to keep struggling opening the trunk with the damaged lock. Obviously that means having a different key for only the trunk, but, sounds easier than continuing to struggle with pliers. Forgot to add - the brute-force method would be cutting the old lock apart with a dremel tool or something like that, but I could see that being tricky, trying to cut through the lock barrel without damaging the lock cylinder, and more importantly, the lock pins. Also - the door lock cylinders, because of the rest of the locking mechanism, may use the locking pin I mentioned - possible the trunk lock cyl. is held in place with a snap ring. If you have those in hand to look at, you'll be able to tell. Obviously a snap ring is easier to remove than drifting out a pin. Snap ring pliers of the right size are the right tool for that. Thank you everyone for this very helpful and useful information.